At Moving Guys, we pride ourselves in offering a variety of local and interstate moving and backloading services across Australia at very competitive prices. We are committed to reliability, quality of service and excellence in our job, something that has seen our customer base expand by the day. So in case you are looking for the best home removals or business relocation services, you are at the right place. We will provide you reliable backloads from and to anywhere in Australia whenever you need us. Let’s say, for instance, you want to move your furniture from Melbourne to Sydney. If there is a moving truck or a container departing soon from Melbourne to Sydney with some spare space, you could pay for that space and have your stuff moved. In another scenario, if you are moving to a destination where a truck is returning after a completed job, you can move your things in the truck that would otherwise return empty. These two scenarios are referred to as backloading. They save you a lot of money because you only need to pay for only a one-way trip unlike when using traditional removalists who give you a quote based on driving to your destination and back. Again, the removalist truck is always being used, saving the empty space and making extra income. 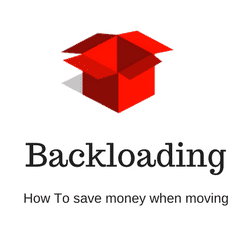 The removalist would rather earn some extra income than none, and this is why backloading is always the cheapest moving solution. Before we backload your items, our moving team will provide you with a very detailed inventory of the goods you want moved in the truck or container. This inventory minimizes any chance of confusion between your stuff and the other goods on the truck. It also helps to ensure that you are allocated the right space in the container or on the truck. Backloading fills (especially interstate) often happen at the last minute since this is when we can determine how much leftover space is available in a moving truck. This means that you should be quite flexible with your moving dates. We are here for you. We have you covered. Moving Guys prides itself on having achieved top rankings as the best full-service interstate removalists company, offering both residential and commercial backloads. Once you hire us, you can rest assured of a comfortable, safe, reliable, and affordable moving services. Our moving team is comprised of well-trained, skilled and experienced drivers and packers who see to it that your property is always safe during packing, loading, transportation, offloading, and during unpacking. We prioritize customer satisfaction, and this is the reason we strictly follow all safety guidelines while moving our clients’ items to ensure they remain in their perfect condition when we complete the job. • Interstate moving services- We provide a variety of interstate moving services which include backloading options, moving trucks, and furniture containers. • Business removals and commercial relocations- We have unparalleled expertise in moving offices, warehouses, businesses, schools, factories, restaurants, hotels, libraries, Furniture, Fitting and Equipment (FF and E), among other services. • New furniture deliveries- We offer specialized high-end delivery, distribution, and transportation services. We also service regular deliveries into shops, distribution centers, restaurants, motels, hotels, and home furniture delivery services. • Packing and unpacking services- If you would prefer our skilled packing team to pack or unpack your precious items before and after moving, we have you covered. • We also do interstate and local furniture storage. – A moving Guys, we have highly-trained moving professionals who have garnered several years’ experience. So you can be sure your items will be in safe hands. – We have competitive prices. While moving can be very expensive at times, we are always open to negotiations. We offer cheap removalists services without compromising the quality of service. – Moving Guys uses sanitized and clean facilities to keep your precious items while moving. We also consider various aspects of your stuff before moving. For specialized services, we use modern moving equipment. – We value customer service and satisfaction. Our customer base keeps expanding by the day, proving our quality of services. Contact us anytime for our budget-conscious local and interstate moving services.